The Gunners boss revealed earlier in the week that Per Mertesacker is set to be out for a number of months with a knee injury, while fellow centre-backs Gabriel and Laurent Koscielny were also left behind as the squad flew to the United States for two pre-season fixtures. That means Calum Chambers is the most experienced central defender on the tour, with new signing Rob Holding also likely to play a major part in both games - starting with the MLS All-Stars on Thursday evening. 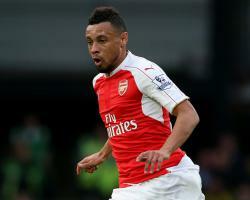 And, although Wenger has said Mertesacker's injury will force him back into the market for further defensive recruits, it appears midfielder Coquelin could become an option at the back. "He is a great player, a great part of the team with his experience," Cech told ESPN FC when asked about the effect of Mertesacker's lay-off. "We will need to make sure that the players who will get their chances to play more, they will take it and they will rise to the occasion. "Hopefully we will be able to start the season well and once he's fit he will come back (with the team in) a position where we all want to be." Cech, preparing for his second season at the Emirates Stadium since his move across London from Chelsea, then called on Wenger's other defenders to step up given the current situation. "Now with Per out, the challenge and the possibilities for every central defender is bigger," he added. This is their moment to show the manager they are up to the task."